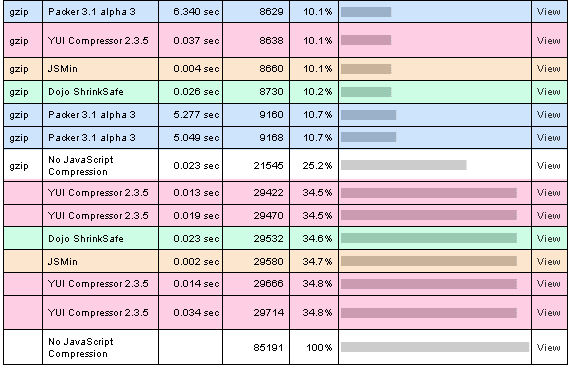 The following compression tools are compared, both with and without the affects of additional gzip compression that are supported natively by modern web browsers. JSMin is a conservative compressor, written several years ago by Douglas Crockford. It is considered safe (especially if you verify your code with JSLint first-- an excellent thing to do anyway) because it doesn't attempt to change any variable names. 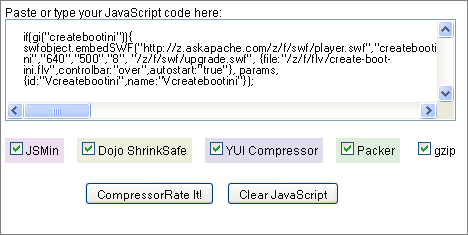 YUI Compressor is a newer compressor written by Julien Lecomte, that aims to combine the safety of JSMin with the higher compression levels acheived by Dojo Shrinksafe. Like Dojo shrinksafe, it is written in Java and based on the rhino library.